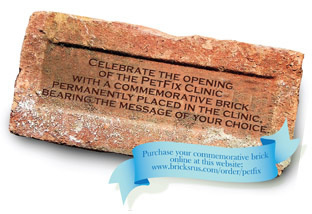 Show your support forever with a commemorative brick in the PetFix clinic! Honor a family member, friend or beloved animal by donating today! Your 4x8 ($100) or 8x8 ($250) brick will bear a message of your choice and will be permanently placed on the wall in our new Euclid clinic. Your brick will help us continue our life-saving work! The items below are constant needs of the organization. We heart fully appreciate and thank you for your generous donation of these item. We have established a Wish List at Amazon.com for your convenience. Amazon Smile Foundation will donate 0.5% of the price of eligible purchases to PetFix. Click here to begin supporting PetFix with your online shopping. When you shop with Goodshop, a percentage of your purchases is donated to PetFix when you choose us as your charity of choice.